Families living in London have reportedly received anonymous letters containing hate material targeting Muslims, it emerged on Tuesday. 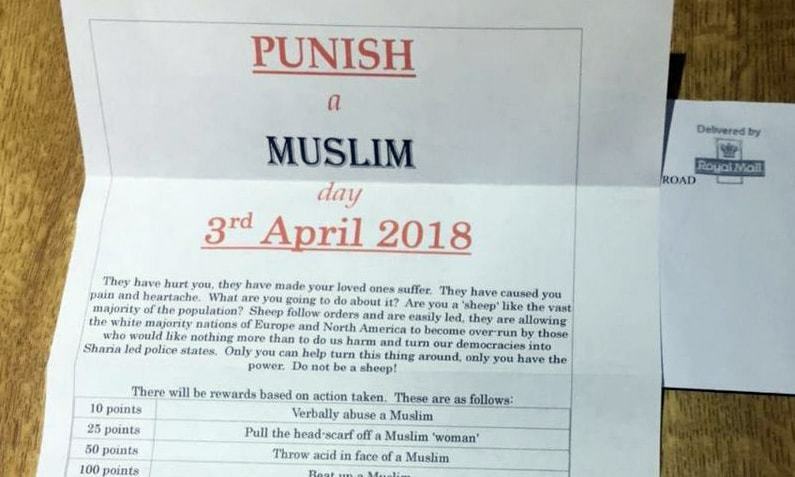 The letters titled ‘Punish A Muslim Day’ were being sent to families in East London, asking them to celebrate the day on April 3, 2018. The letter details a point system for each act of hatred against the Muslims and also suggests a reward for it. For example, abusing a Muslim is said to have 10 points, pulling a Muslim women’s hijab is worth 25 points, throwing acid is marked 50 points while burning or bombing a mosque is a whole 1,000 points. The Muslim population living in London believes that this is a part of a larger campaign of hate against the Muslim community. According to authorities, at least six communities around the United Kingdom have received the letters, which are being investigated by the country’s counterterrorism forces. In a Facebook post, Naz Shah, a member of UK Parliament, wrote that members of her community are very distressed. “I would appeal to the wider community to remain vigilant and report any suspicious activity to the police,” she wrote. It’s not clear who sent the letters or what they’re trying to accomplish. It seems, though, that the writers targeted predominantly Muslim communities. Muslims believe that Islamophobia is already at high and worrisome levels in the UK.